How do I transfer a music playlist from my iPhone to iTunes? Have you accidentally deleted your playlist on iTunes? But, you found that you still have deleted a playlist on your iPhone. In this scenario, all you want to do is to transfer your playlist from iPhone to iTunes so that you can enjoy playlist on iTunes too. Here, in this article, we are going to tell you how to transfer playlist from iPhone to iTunes via iTunes. And users who don’t want to use iTunes to do this, this article has also mentioned a great way for them. iTunes is a reliable and official tool to manage iOS media files, which include audiobooks, music, movies and much more. There are many users who prefer to use iTunes when it comes to transferring a playlist from iPhone to iTunes. So, if you also want to copy playlists from your iPhone to iTunes no matter what reason is, the first method you can try to do this is using iTunes. In fact, you can sync your iPhone other files also to iTunes and this will save your files from data loss satiation. 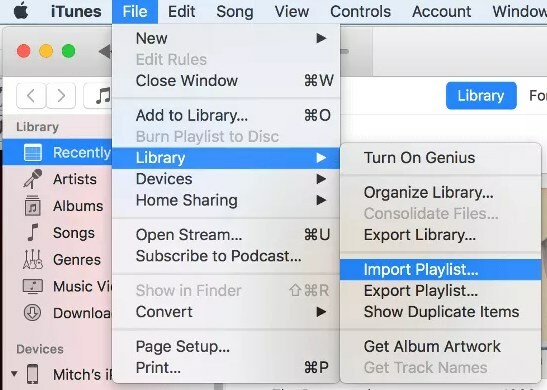 To begin the process, run the latest version of iTunes on your computer and then, connect your iPhone to the computer using a digital cable. Next, tap on the device icon i.e. at top-left corner and this will display all your iPhone playlist. After that, select a particular playlist. And then, move to File>Library>Export Playlists. Now, you need to select a destination folder where you want to save it. Finally, the playlist will be saved on your system as an XML file. Thereafter, go to “File” and then, choose the “Library” option. After that, choose “Import Playlists” from iTunes. 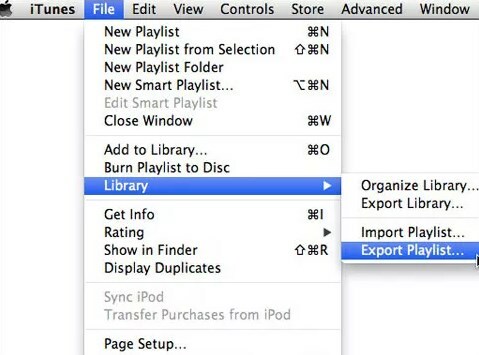 Finally, search out the exported playlists to import it to your iTunes and that’s all. Note: You can’t transfer all the playlists from your iPhone to iTunes library once and you have to transfer one by one. Also, you need to make sure that all the songs in the playlists that you are going to copy must be in your iTunes as well. If that’s not the case, then you may face trouble while playing playlists in iTunes. So, transferring playlists from iPhone to iTunes is not a difficult job and all you need is iTunes on your computer. However, if you face problem while copying playlist from your iPhone to iTunes via iTunes, then don’t panic. And you can go for the other way i.e. third-party software. Sadly, iTunes shows many problems while transferring or syncing file between iPhone and iTunes and that’s why there are many third-party tools available to make the process easy and smooth. Do you want to transfer playlist from iPhone to iTunes without iTunes? 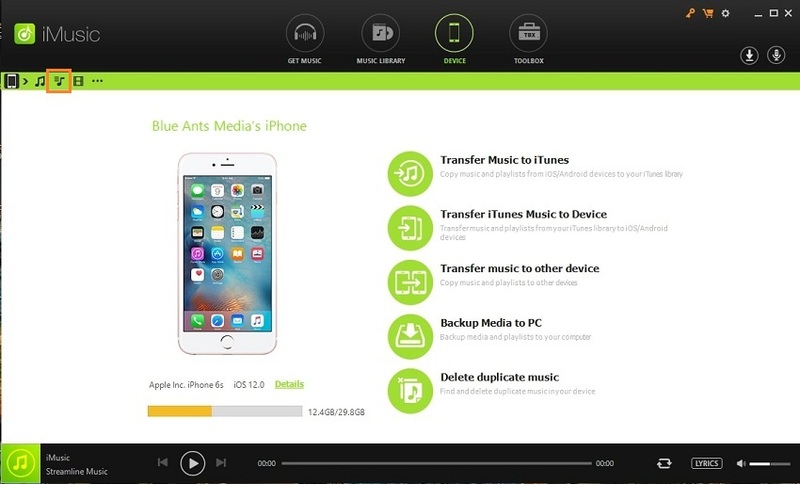 And want to transfer all the playlist from iPhone to iTunes once? Then, you can try iMusic. It is an all-in-one music downloader, transfer and manager that you can use to manage, download and transfer music with so ease. And you can also use this tool to transfer playlists from iPhone to iTunes. 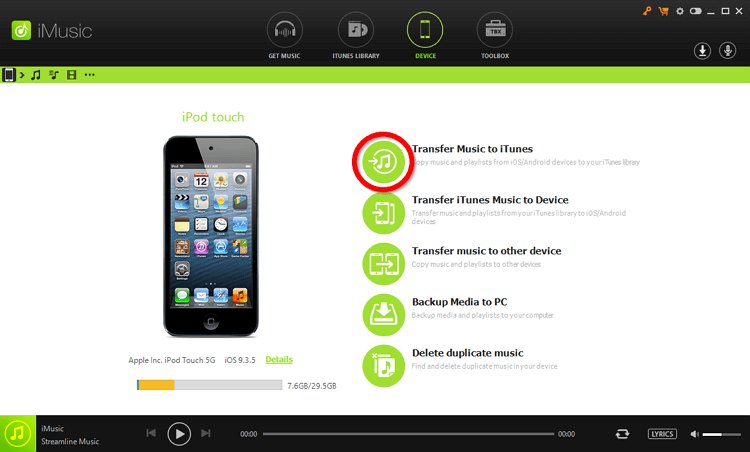 In fact, you can transfer data between iPhone/iPod/ Android devices and iTunes/PC/Mac. The best thing about the tool is that you can transfer songs or playlists between iPhone and iTunes without losing existing data on your iPhone. 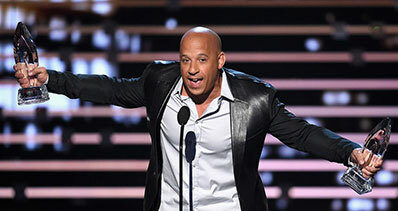 And the tool provides a one-click option to copy music from iPhone to iTunes without leading any duplication. Transfer full Playlist/video from iPhone to iTunes with original quality. Download music from numerous music sites, which include YouTube, DailyMotion, etc. 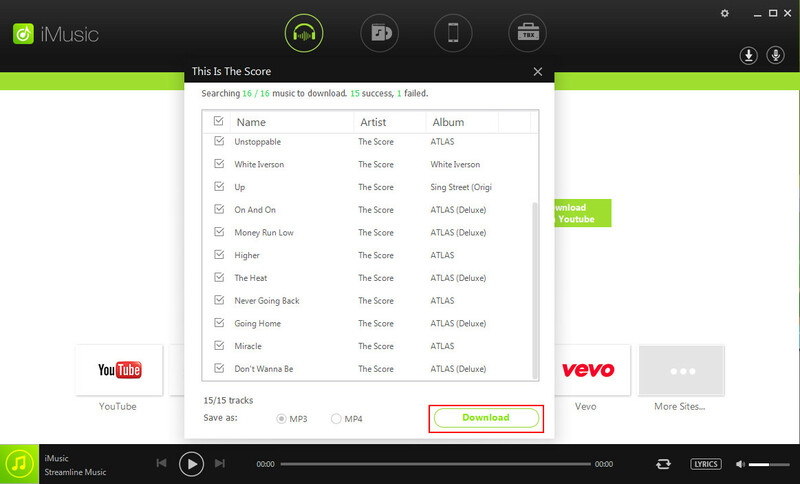 Record music from any site or video or audio playing in your system with one-click. 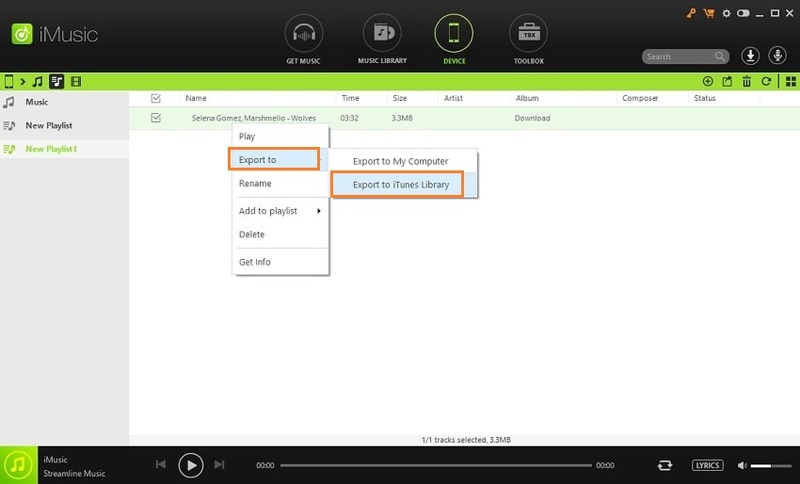 Automatically save recorded and downloaded music to your library for easy transfer and management. 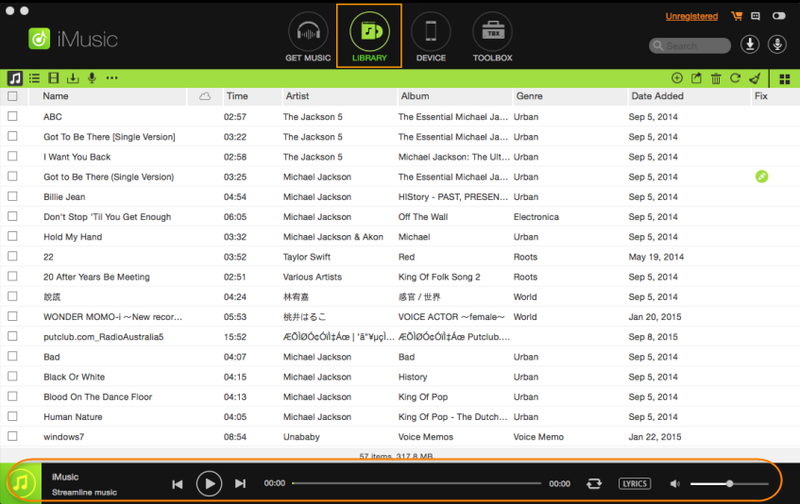 Built-in music library allows you to preview and browse the hottest and latest music from various music sites. 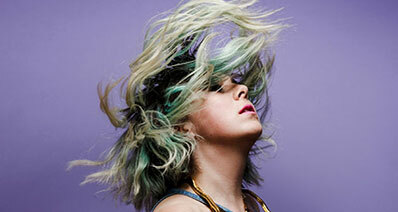 Tag and identify music with the album, artist, genre, and much more using ID3 tag technology. You may find numerous ways to transfer playlist from your iPhone to iTunes, but iMusic is a way to transfer it in just single click. Download iMusic from its official site on your computer and install it. After its successful installation, run the software. 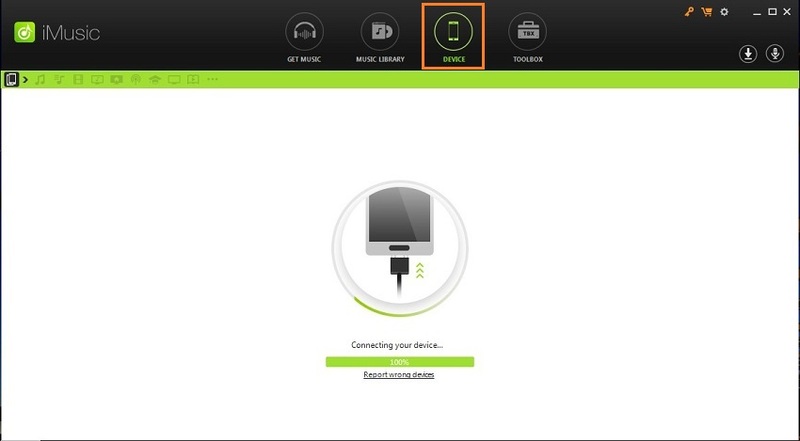 Next, click on the “Device” icon and connect your iPhone to the computer using a digital cable. Next, you will get a notification on your iPhone if you have connected your device to a computer for the first time. So, click on the “Trust” button for connection. Once the software detects your device, you will see various options, as shown below. You need to click on “Playlist” icon as shown in the figure. Now, your iPhone all playlists will be displayed here. Select the playlist you want to transfer and then, right-click on the selected ones. Finally, select “Export to”>”Export to iTunes” option and that’s all with the process. So, you have seen yourself how much it is easy to transfer playlists from your iPhone to iTunes library. As it is free to use and that’s why you can give a try to it and get to know how amazing it is when it comes to managing, downloading and transferring music or playlists. When you are going to transfer playlists from iPhone to iTunes library, there are numerous things you need to pay close attention to make sure that you are transferring the playlists properly. If you don’t pay the attention, then you may have the playlists in your iTunes library playing not properly. So, there are certain things that the user should overlook and consider them before copying the playlists from iPhone to iTunes. This will surely save your effort and time when transferring and avoiding the problems that can occur during the process. It is the most common problem that a lot of users face when copying playlists from iPhone to iTunes. You transfer playlist from your iPhone to iTunes successfully, but you face problem while playing. That’s why it is always recommended for users that they should check if the playlist is working properly on their iPhone before transferring. If the playlist is not working properly on your iPhone, then there is no chance that it will work in your iTunes application. Before you begin with transferring playlists from your iPhone to iTunes application, you need to make sure that your iPhone is properly connected with your computer during the entire copying process. Once you lost your iPhone connection from your computer, the copy process will stop right away and you will complete the process. 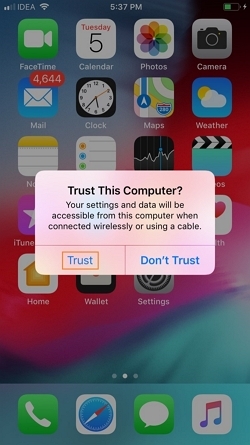 So, in this case, all you can do is to ensure you are using undamaged digital or USB cable to connect your iPhone to the computer. Generally, damaged cable leads you towards this kind of problem. In most cases when it comes to transferring or syncing files between iPhone and iTunes, the outdated iTunes version is the main problem. Even though it is a small thing, it is quite important you can’t ignore at all if you want a smooth transfer. Before you make any transfer, you need to make sure that you have downloaded the latest version of iTunes on your PC. Having iTunes latest version will greatly reduce the possibility of facing issues when modifying and playing the playlists you copied. Generally, iTunes latest version fixes the errors that are present in the older version. As you need to have the latest version of iTunes and similarly, you need to make sure that you have downloaded the latest version of the software you are using i.e. iMusic. Having the software latest version will ensure that you will probably avoid the problems while transferring. 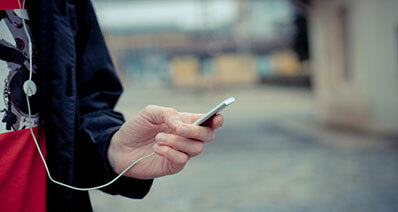 Do you want to use your iPhone playlist on your iTunes library? Then, you also need to make sure that you must copy all the music present in the playlist you are planning to transfer. This is because when you try to play your iPhone playlist on your iTunes, all music of that playlist will work without any trouble. Conclusion: That’s all on how to transfer playlist from iPhone to iTunes with and without iTunes. As there are many chances that you will face some errors during or after transferring playlist from your iPhone to iTunes via iTunes. And that’s why it is better you use iMusic when it comes to copying playlist from iPhone to iTunes without any hassle. This software has overcome all the downsides of iTunes and so, try iMusic and get your iPhone playlists on your iTunes within a few minutes.